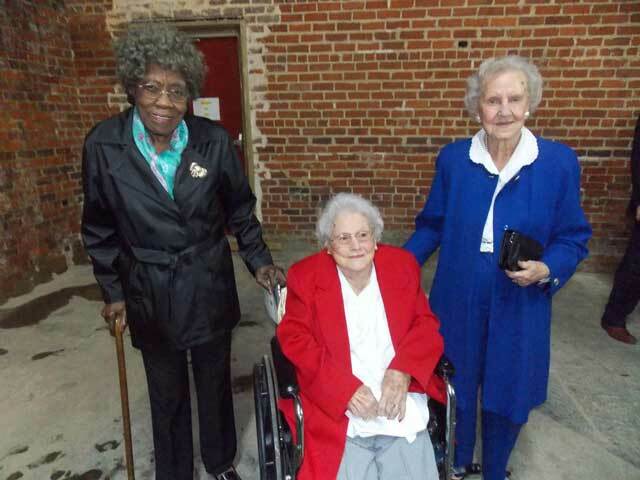 On Sunday, May 5th, over 100 people gathered in the warehouse of the Edwards Building in downtown Johnston to celebrate the lives of three of the Town’s pioneering developers. 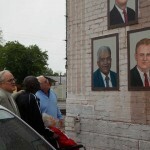 Van Edwards, Jr., Frank Burt and John S. Edwards, Sr. were selected by a committee of the Town Council to have their images added to the mural of the International Peach Exchange. Mayor Andy Livingston presided and attendees were delighted to hear from family members who told of their remembrances in the lives of the honorees. Lewis Burt, John S. Edwards, Jr. and Robert Edwards told of the times in Johnston when there was a need for local, affordable housing with Milliken phasing out their mill-owned housing and Riegel Corporation hiring workers for their new plant. The Edwards cousins set out to meet this demand with the formation of Colonial Acres Realty. With the capable assistance of their lead builder, Mr. Burt, the area west of Leer Street encompassing Hillcrest and Woodside Drives became the initial target of their development, but other areas would also be built up and local businesses were founded. Sunday’s event was made even more memorable by the attendance of the spouses of this year’s honorees: Ms. Lola Burt, Ms. Mary Edwards and Ms. Vivian Edwards. The Mural is the Hall of Fame for the Town of Johnston. This was the first addition to the Mural since 2001. The selection committee voted to renew this project every four years. 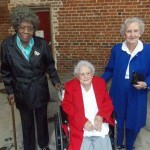 Ms. Lola Burt, Ms. Vivian Edwards and Ms. Mary Edwards. Ms. Mary Edwards & son Robert viewing murals. 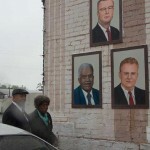 Ms. Vivian Edwards and sons John Jr. and William and longtime care giver Ernest Martin viewing murals. 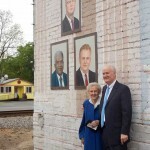 Ms. Lola Burt and Lewis Burt viewing murals.